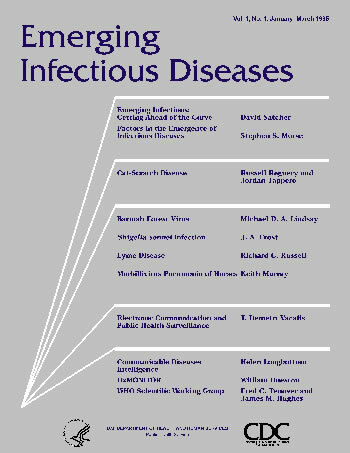 Description: This issue contains information on Emerging Infectious Diseases. Description: Women and Infectious Diseases. Description: Update from Brazil -- Measles Elimination -- Drug Resistant Enterococci -- Malaria Developments -- Hanavirus in Children -- Dengue Reemergence in Cuba. Description: Gulf War Illness -- New Paramyxovirus -- New Vectors in Africa -- Update on Malaysia. Description: New Agents -- The Global Threat -- Foodborne Diseases -- Vector-borne Diseases. Description: Hantavirus Research -- Genetics Issues -- Australian Perspective. Description: Bacterial Toxins -- Pandemic Influenza -- British Perspective. Description: Lyme Disease Vaccine -- Antibiotics in Animal Feed -- French Perspective.